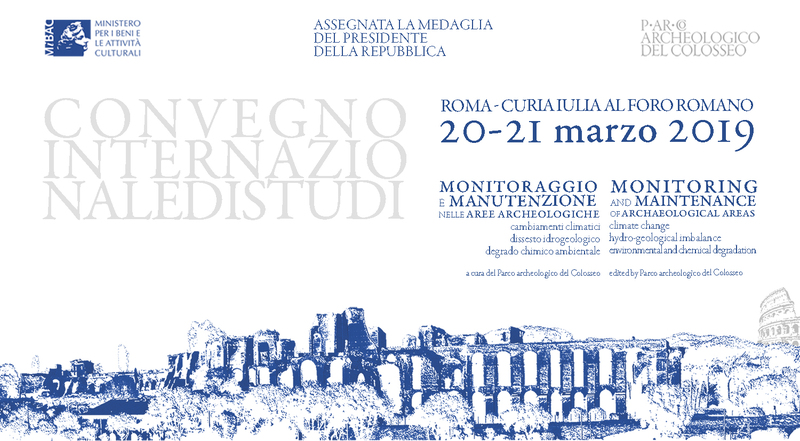 Opening on Wednesday 20 March at 14.30 and continuing through the 21st, the Parco is happy to present the international conference, “Monitoring and maintenance of archaeological areas. Climate change, hydro-geological imbalance, environmental and chemical degradation”. The efforts on the part of the Parco archeologico del Colosseo, promotor and organizer of the two-day event, have been recognized by the President of the Italian Republic, who has awarded the Parco with the Medal of the President of the Republic. To tackle a series of extremely current issues such as climate change, hydro-geological imbalance, and environmental and chemical degradation, the Parco archeologico del Colosseo has gathered both domestic and international representatives from some of the most important archaeological sites present on the List of World Heritage Sites, in addition to representatives from institutions actively experimenting with innovative methodologies for the conservation of our cultural heritage. Our goal is to identify the best practices most suited for the management of archaeological areas. Monitoring and planned maintenance will be the keywords of the two days of the International Conference planned in the Curia Iulia in the Roman Forum—two words which make up the vocabulary of anyone who works daily to conserve and therefore pass on the cultural legacy of our heritage. Below is the definitive conference schedule.